‘Grissini’ (in English breadsticks) are long, crumbly and crunchy sticks that can be eaten before lunch, during a meal, or as snacks; very digestible, even if their content in calories is high; ideal for accompanying slices of cold meats, very decorative if placed on any laid table. In particular, the Grissini coming from Piedmont, and above all those from Turin - dubbed ‘Grissinopoli, that is ‘town of Grissini’ - are characteristic because they are much thinner than the other ones. They were born by the skilled gestures carried out by master bakers and represent the rustic and authentic flavour of tradition, a must have of Piedmont’s gastronomy and cuisine, but also one of the most famous products of Italian cuisine abroad. Breadstick has a precise date of birth: 1679, when it was created by the cook of the Savoy’s House, Brunero, on the recommendation of the court doctor Teobaldo Pecchio, who wanted to feed the little Vittorio Amedeo II, the future Duke, whose digestion was slow and difficult, with bread subjected to more intense cooking. The doctor remembered that his mother made him eat crisp bread, with little crumb, and asked the baker to try to make an elongate ‘Ghersa’ (this was the name of that bread, which means ‘row’; as a matter of fact, breadsticks are produced by cutting long strips from a loaf of dough). His creation was very successful, thanks to its digestibility, long-life, highly nourishing properties. And it was called Kings’ food, and more precisely subjected to kings’ quirks, as King Carlo Felice of Savoy crunched them in his box at the Teatro Regio, crumbling them for fun during the performances! Moreover, Napoleon ‘fell in love’ with the delicious ‘petits bâtons de Turin’, as he called them in French, so that he instituted a bus service from Turin to Paris for avoiding the risk of remaining without them. But it is easy to say ‘breadstick’. 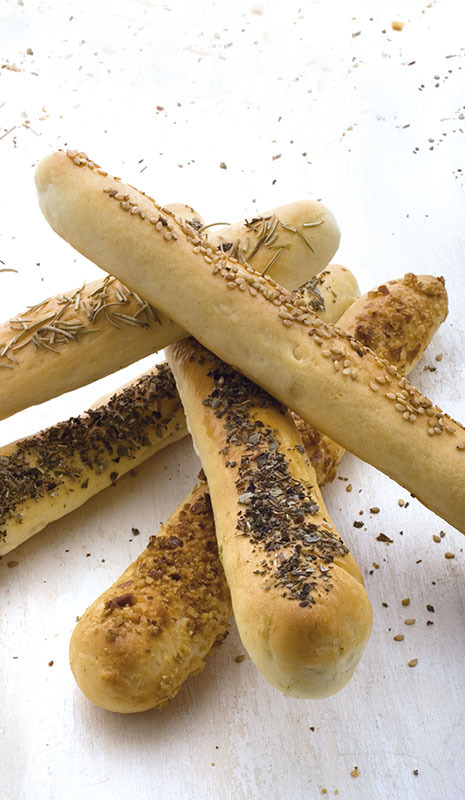 Indeed, there are various types of breadstick. 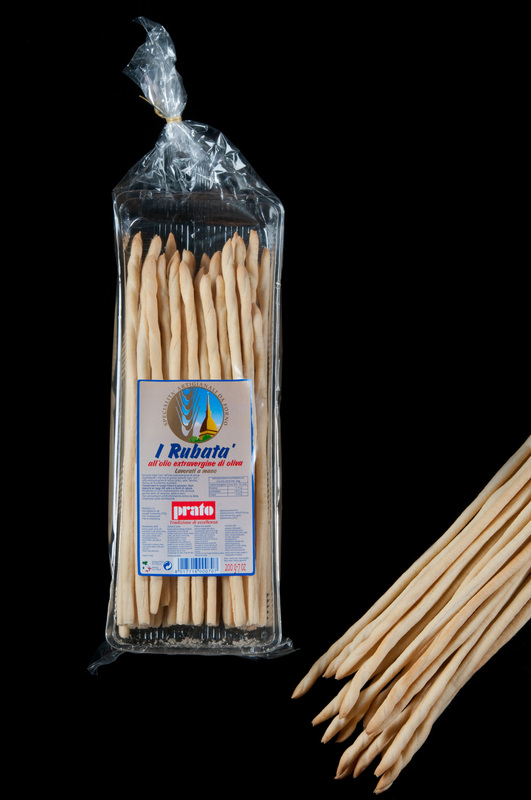 The discussion is open about which product was the first one to be born: if ‘Robatà’ (to be read ‘rubatà’, in the Piedmont’s dialect, that is ‘rolled’, in order to remind baker’s gesture), from 40 to 80 cm long, knotty because of its manual working, or the ‘stretched’ one (the classic one is prepared with water, its ‘twin’, produced with oil, is tastier), the only other form of traditional and protected breadstick, crumblier, which stands out because its dough is stretched keeping its edges, as long as baker’s arms, instead of being processed by rolling it. 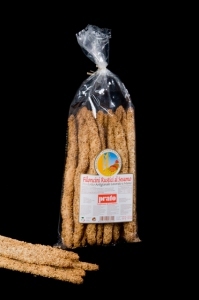 Over time, the family of breadsticks grew and there are many recipes of these thin sticks, depending on their place of origin, Piedmont or Aosta Valley. ‘Robatà’ and stretched breadsticks have become the forefront of an army made ​​of sesame, corn, red pepper, olives, fennel, walnut sticks, with or without fats, prepared with Khorasan wheat or whole wheat flour, with and without fibre. There are even breadsticks with chocolate or caramel. As for shapes and sizes, they can be long, short, thin, thick, very cooked, clear. Bakers’ imagination runs in a thousand different ways. 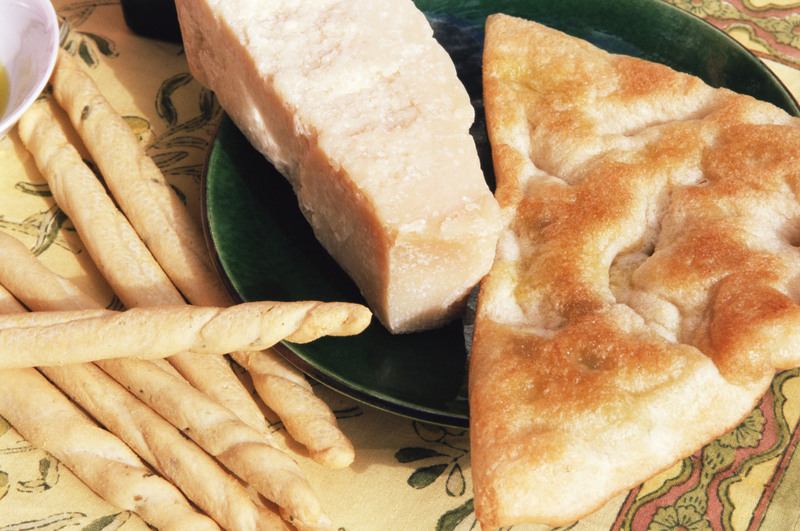 Breadsticks can be proposed in many combinations: they are ideal as delicious snacks, which can be served with ham, Parmigiano cheese, olives and capers; excellent appetizers. Its sweet version is often used for accompanying sweet wines of Oltrepò. Breadstick, with its past celebrity, continues to meet great success among its consumers and has become more ‘modern’. 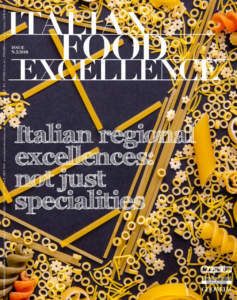 In this perspective, innovative, but loyal to tradition, the company Prato (located in Trofarello, Turin’s province), in its fourth generation, produces its breadsticks. 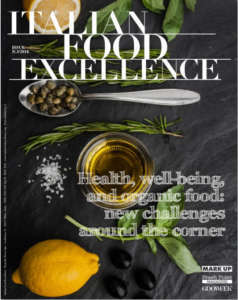 Paolo Pipino, one of its owners, states: «With its 150 years of experience, our company combines the tradition of a handicraft quality product with the most innovative ideas in the field of bakery, with such products as ‘Grissol’, ‘Lingue lunghe’, ‘Pan dei nonni’. We take care of innovation and quality without forgetting old values. If ovens could talk, they would tell about braided breads which smelled when they were removed from the oven, filling the air with steam and perfume. The whole family took part in the work, kneading, baking, preparing baskets, and so on. From those braided loaves prepared by our great-grandparents Pipinos’ hands, much water passed under the bridge: increased production, around the family the first workers and those braided loaves which became more and more tapered, until they became breadsticks, our ‘Treccine’, a speciality which today is more and more requested». Many specialities were born: ‘Cosetti’, delicious crisp little breads, characterized by an irregular shape, flavoured with sesame, olives, rosemary, and o nions, with a delicious salty surface; the line of breadsticks ‘Piuma’, so called because of the lightness of the product and unusual tenderness of its crust, which the company achieves thanks to a wise processing consisting in a long and complex leavening; ‘Filoncini Rustici’ with sesame, produced in order to meet the needs of an increasingly diversified population as for origin, which have been successful both in Italy and abroad. These are quality specialties, always manufactured by using traditional methods, because otherwise they would lose their identity, which needs breaks during processing, long times, and above all manual working, which in some passages gives the product its peculiarity, as the owner tells. Finally, the ‘jewel’ of this production: ‘Rubatà’ prepared with extra virgin olive oil, an evolution of the typical speciality, but enriched with extra virgin olive oil. The tradition of breadsticks produced by Prato is an excellence one as for packaging, too. It is deliberately transparent or realized with paper bread, but always keeping transparent the central part of the front, in order to allow seeing and appreciating the product in its craftsmanship. For instance, this happens for the recent line of ‘Stirati’ of Piedmont with extra virgin olive oil, or their ‘cousins’ prepared with water, corn, wholemeal flour, rice oil. 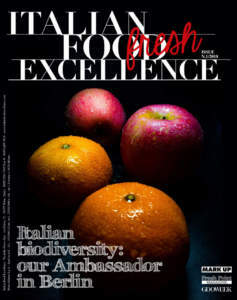 All these products are appreciated in foreign markets too, by people fond of Prato’s breadsticks in France, Spain, Portugal, Germany, Denmark, Sweden, Netherlands, and Australia.